Whole movie is on youtube if you don’t mind Danish subtitles. This movie apparently was produced and written for Lifetime TV. I don’t know if it ever showed on TV but if so, kudos to them. I don’t think I’ve seen a made for TV movie that specifically dealt with a lesbian relationship. So… I really liked this story. Both actresses did a great job and it felt believable. Yes, it is the cliché of the unhappily married woman who unexpectedly finds herself attracted to a woman for the first time, but it was well written. What I liked about it was that all the characters involved act how one would expect they’d act in this situation. Kate and her husband are mutually OK with splitting up, although her husband would be fine keeping the status quo. Kate has always wanted to be a wife and mother and that’s what she went for. They have a nice upper middle class existence, but Kate is just not happy and decides that she wants a more fulfilling life. She ends up working for Mac at Mac’s real-estate agency. Mac is an out lesbian. Both women get closer as they work together and Kate finds herself attracted as more than a friend to Mac. Mac is very leery when Kate professes that attraction because, um, Kate is straight and Mac doesn’t want to be some straight woman’s experiment and she doesn’t want to be a straight women’s secret lover. Mac has lost the love of her life and is also reluctant to find someone knew. While they dance around each other trying to work out both an attraction and mixed feelings about that attraction, Kate gets the guts up to tell her husband, children and best friend about her attraction to Mac, which goes over…not well…at first. This movie is a kind of a sweet romance, but it also deals realistically with all the issues around homophobia, possible “gay for you” as Kate can’t really say she’s now a lesbian, and fear for glbt person being used as a fling. It also addresses certain stereotypes of what straight people think about gay relationships. I liked that it wasn’t cheesy, nor was this movie melodramatic. In fact, all the characters act rather maturely for this kind of situation, considering. The only negative thing I will say is that it did come across as too insta love for me at first on Kate’s side. There is a nice build-up of a friendship between Kate and Mac, but those special things that would occur between two characters falling in love seemed missing. They are just normal, good friends one min and suddenly Kate is kissing Mac out of nowhere. I would have loved to see more sexual/ romantic nuance between the women before that first kiss. However, it is an HEA and still an enjoyable movie. A widow, recovering from the death of her husband, comes to the big city to spend time with her busy professional daughter. Instead, she forges an unlikely relationship with a commitment-phobic lesbian who has a past with her daughter. I had watched A Perfect Ending, which I loved, about an older / younger women relationship. So I was attracted to Tru Love, hoping it would be as good for me as the other because it’s also is about an May/ Dec female relationship. 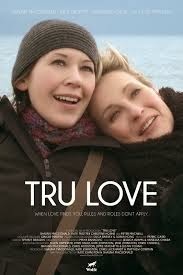 Tru Love, while compared often to A Perfect Ending, is a very different film though, and can’t be compared really. Well not in story. I will compare it when it comes to personal feelings about May/ Dec love representations. Maybe it was just my mood, but for most of it I felt a bit uncomfortable watching this. And while I just said Tru Love should not be compared to A Perfect Ending, what made that less uncomfortable for me was the fact that that relationship started out and is based on a business deal, so the lines are clear at the beginning and age difference wouldn’t be a factor in it. In this movie, it’s really about a love that develops between a 60 something woman with a late 30’s something woman. For some reason, I felt a kind of dread throughout most of the film mainly because I wasn’t sure I wanted to see these two characters actually fall in love and be intimate. And I’ll be honest in that probably my discomfort is that I’m an older woman myself and would feel weird being with a much younger woman like the one in this film. Although, actually, if I would put myself in the position of a younger woman attracted to an older one, that wouldn’t have made me feel uneasy at all. Tru is a lesbian who seems to be fairly callous in her relationships with other women. She won’t commit to anyone and seems to have one night stands and brief relationships one after another, not even bothering to remember their names. Suzanne, one of those past women, asks Tru, who still has the key to that Suzanne’s house (side bar- I wonder how real it is that lesbians having brief affairs give each other keys to their houses after a few nights, which seemed to be the case in this movie), to let her visiting mom in. Suzanne is a lawyer and a workaholic. Due to Suzanne never being home, Tru sort of entertains Alice, Suzanne’s mom. They like each other right away and start getting very close to the discomfort of Suzanne. On the one hand Suzanne is feeling a bit jealous of time her mom is spending with Tru, but on the other she won’t stop working. When she sees that Tru and her mom are getting a little too close she tries to thwart their relationship, which upsets both Tru and Alice, who think the other is avoiding. As for Alice, her husband has died and for the first time she feels free to let go and enjoy life. The ghost of her husband is there and talks to her when she’s musing, so we get some background on what Alice’s life has been about. Alice’s zest for life and enjoyment of Tru, and maybe also because she is an older woman who Tru relates differently to than women her own age, makes it easier for Tru to open up about her painful past. So we get to see why Tru is a commitment-phobe. This story is just as much about a mother/ daughter relationship as an f/f relationship as tensions rise up between Alice and Suzanne about Tru. It also makes Suzanne confront her avoidance of any kind of a life outside of work. She’s very uptight and this cracks her shell. So the crux of my discomfort is that I felt Tru and Alice connecting as two people might with that kind of age difference, but couldn’t see it entering into a more intimate thing, which it did. On the other hand, truly, I think I ended up liking this film because it does show that love and relationships between people can go beyond what society might deem appropriate or not. (between consenting adults) And I appreciate stories like this that go outside the box. I’d definitely recommend this story if you’d be open to a May/Dec story with a much older woman.